Nothing endears a new homeowner to the neighborhood like an exterior renovation. I found this out in 2005 when, shortly after moving into my Beachwood Canyon house, I had the peeling garage and fence repainted. When I finally scraped up the money to repaint the house itself last summer, my neighbors were nearly as happy as I. On a far grander scale, the exteriors of two famous Hollywoodland houses are being tranformed at the same moment. 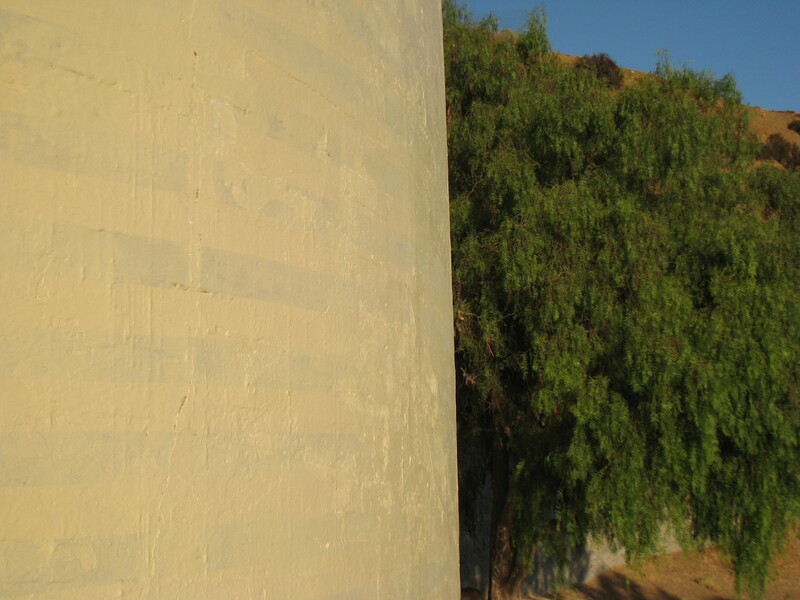 Castillo del Lago, which finally sold in July for $7 million (down from $14.95) is losing its terra cotta paint; the red ochre stripes on the retaining wall have been painted over. 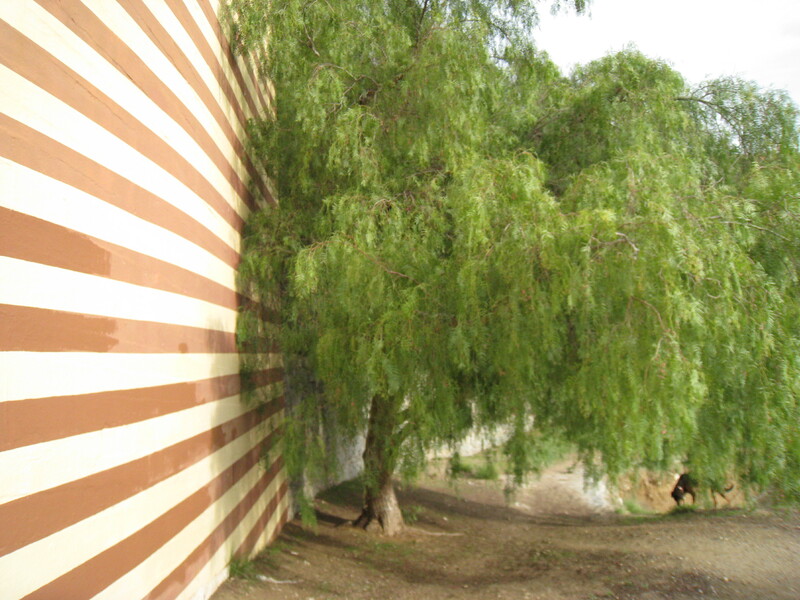 (I miss you already, striped wall!) At present, the new paint is pale yellow but that might be a base coat. At the other end of the trail, Wolf’s Lair’s exterior transformation is much more ambitious. It has been re-roofed and is undergoing a partial reframing. 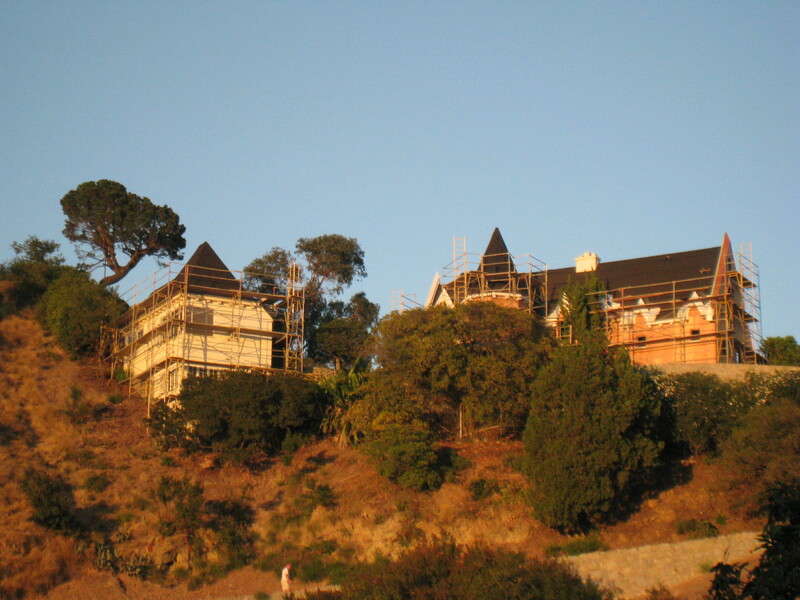 Some of the turrets are being rebuilt, after which a massive re-stucco job will begin. There’s nothing better than a house-proud new owner! 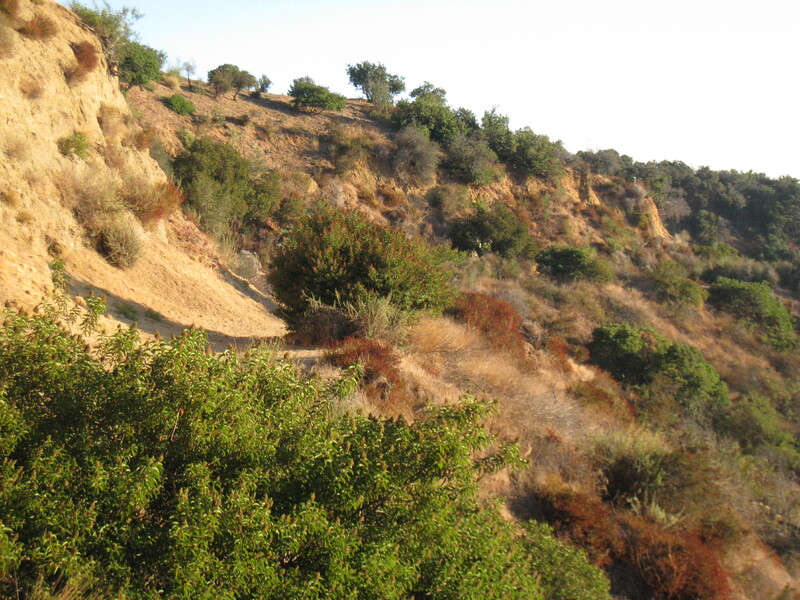 Exactly nine months have passed since I posted “Lost (Mulholland) Highway: The Trail from the Madonna House to Wolf’s Lair.” https://underthehollywoodsign.wordpress.com/2009/12/20/lost-mulholland-highway-the-trail-from-the-madonna-house-to-wolfs-lair/ Hiking the trail today, I was struck by the seasonal difference: some of the green foliage in last year’s pictures is now brown and rust, giving the trail a distinctly autumnal appearance that to my mind is as beautiful. 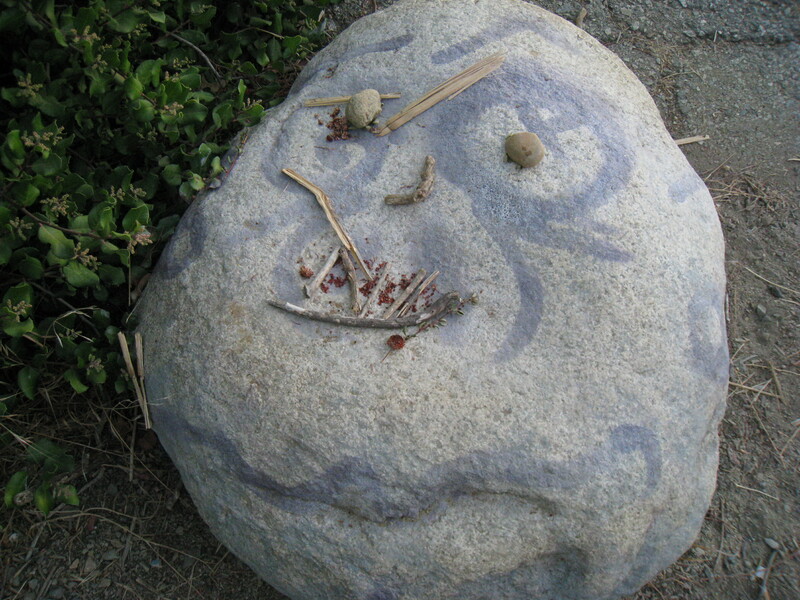 What isn’t beautiful is the graffiti that mars the trail in places, most disturbingly on “Face Rock.” Apparently someone thought the rock needed a more permanent face than the one that passing hikers fashion daily from leaves, stones, flowers and branches. So he spray-painted one on it. This happened a while ago, and though it’s not the first incident of tagging on the trail, it certainly followed my previous post. 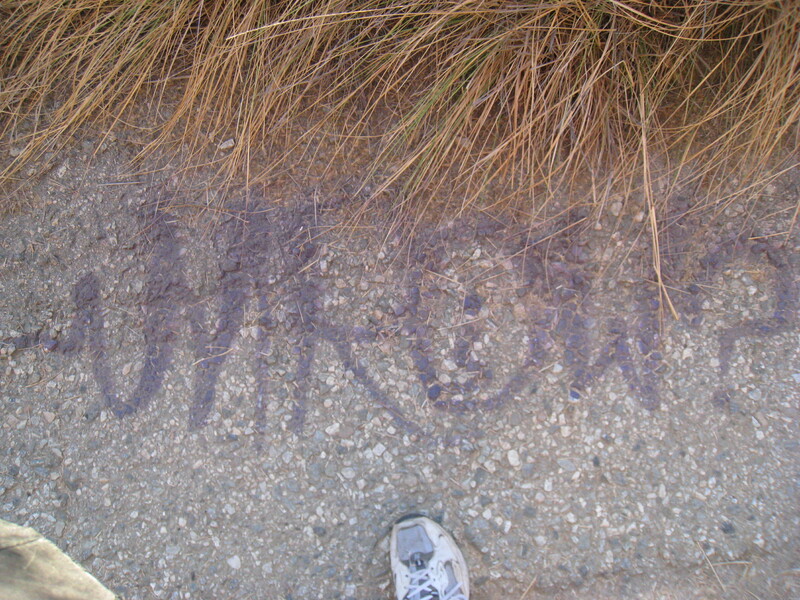 In the intervening months, I’ve wondered if, by writing about the rock, I may have indirectly caused it to be defaced. If so, I’m deeply sorry–but somehow I doubt the tagger in question read this blog. Whoever he is, I wish he hadn’t done it. Most American movie critics have knowledge of a foreign language–perhaps French, Spanish or German. Regardless of the critics’ degree of fluency, however, the languages in question are almost always European languages. Few to none have any knowledge of an Asian language, yet from time to time all will review Chinese, Japanese or Korean films, relying on subtitles to make judgements about the characters, dialogue and story. These days, subtitles are usually quite accurate, at least in the literal sense. It’s been more than a decade since I’ve seen a film in which the subtitles didn’t match the dialogue–as I recall, it was a Cantonese film called “Stage Door,” which in places had subtitles rendered so inaccurately (and, to me, hilariously) that they seemed to belong to an entirely different movie. Since then, I’ve found most subtitles to be slavishly literal, which is almost as problematic. It’s not chilling in the least. In Japanese, people commonly refer to themselves in the third person, particularly in family situations, a linguistic characteristic that has nothing to do with megalomania and everything to do with the importance of family roles. In Japanese homes, people are called–and call themselves–mother, father, grandmother, grandfather, brother and sister; the English equivalent would be “you” or “I.” In “Nobody Knows,” the mother–however emotionally stunted and criminally negligent–is simply speaking standard Japanese. The mother, who’s played by a Japanese television personality named You, for whom the part seems not much of a stretch…. Yes, he does–but that’s a standard man-to-man greeting in a society where emotions are deeply felt but infrequently verbalized. The gruff father, a man of few words, is an archetype in Japan, a country where garrulous types are labeled chatterboxes and fluid speakers are often dismissed as insincere. In singling out this innocuous line of dialogue, Dargis colors the father’s character in a way the Japanese original doesn’t. Obviously, the nuances of the Japanese language can scarcely be understood by American critics who don’t speak it. But it’s not too much to ask that they run their reviews by people who speak Japanese and know the culture. Until that happens, it’s up to those of us who do to keep correcting them. As I wrote a couple of weeks ago, Carol Moldaw is reading her poetry at Skylight Books tonight, her first appearance in Los Angeles in many years. The event goes from 7:30-9:30pm and all are welcome. Skylight Books, 1818 N. Vermont Avenue, Los Angeles 90027. He’s not the only one. 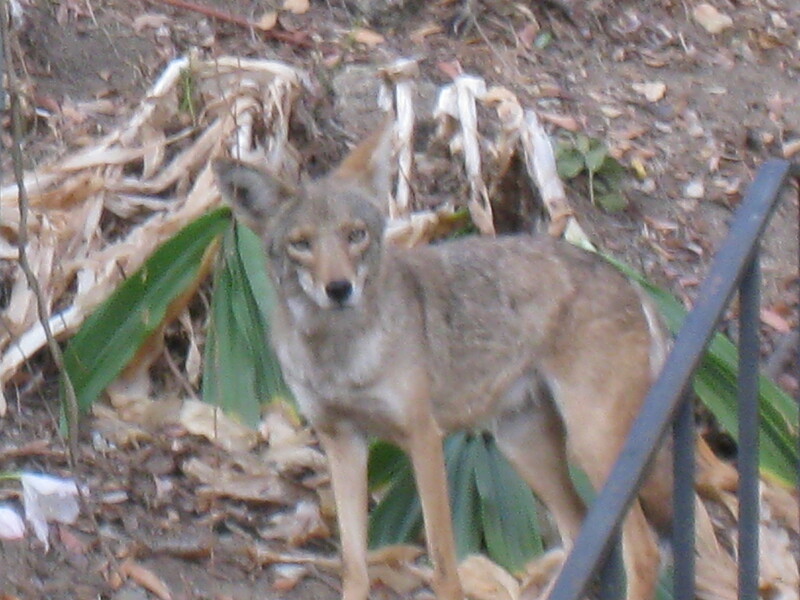 Other Canyon residents feed coyotes in less overt ways, by throwing them chicken bones and other scraps and leaving low-hanging avocados on their trees. One notorious coyote feeder even claims to have struck a bargain with them–in exchange for food, the coyotes apparently have agreed not to eat his cats. Water bowls are common, placed outside in the belief that providing them with liquids is a humane gesture. 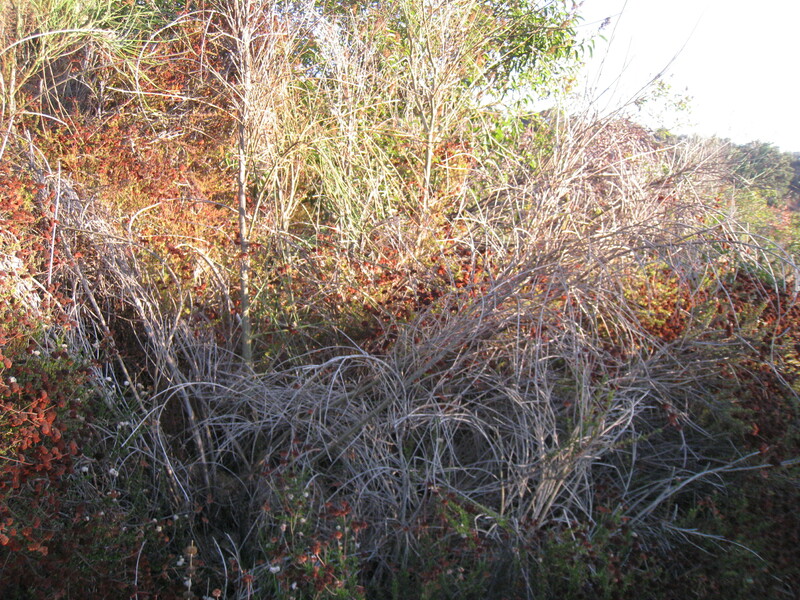 The fact that feeding wildlife is illegal is not a concern, as enforcement is nil. God help Beachwooders who point out that coyotes and other scavengers are not only capable of finding food and water but are not helped by these measures. The feeder-waterers will accuse them of heartlessness and will go on doing it, while the objectors will try to ignore it. 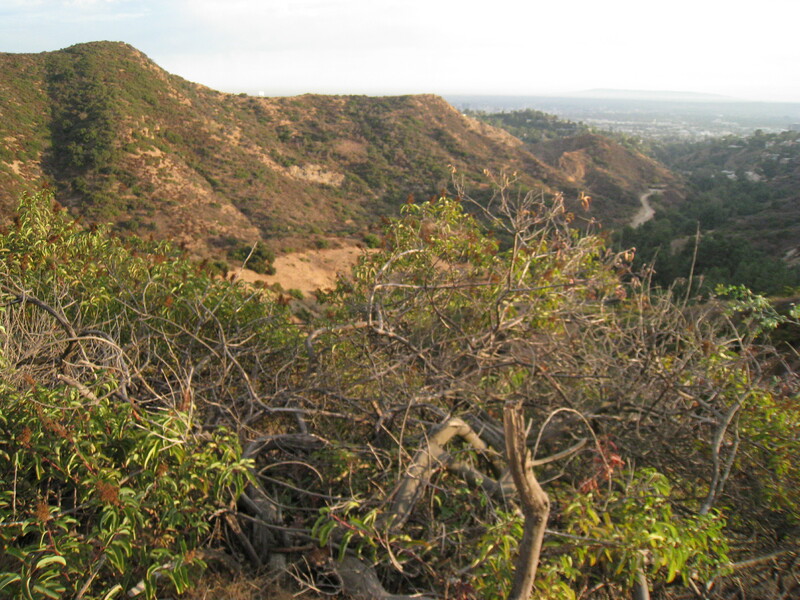 As a result, areas of the Canyon resemble an outdoor cafeteria for wildlife. The sight of a coyote trotting along the sidewalk of Beachwood Drive at 9am is not uncommon. From April through July of this year, my roof was requisitioned by flocks of enormous crows who each dawn would screech and fight above my head before flying up en masse to eat breakfast on my neighbor’s deck. When I finally said something to her, I received a diatribe about my selfishly wanting to sleep and not liking nature. On walks in the neighborhood, I see bread left out for birds and squirrels, along with copious droppings. A neighbor reports that as a result the squirrels have become so numerous that they are undermining the foundation of her house. The coyote pictured above, nicknamed Wolfie by the neighbor on whose property he was born, has been a fixture by my house for the past three years. He and my dog were frenemies, barking at each other through the window and occasionally encountering each other on walks. But over the past year, a severe case of mange has taken all of Wolfie’s fur. It will kill him–yet somehow he survives, completely hairless and terrifying-looking. Thus when I heard from someone whose dog had recently attacked Wolfie, I assumed the worst. However, the following week I happened to meet a woman who knew the coyote well. She reports Wolfie is alive and that his mange is being treated by a friend of hers. When I asked how, she said he feeds the coyote balls of raw meat spiked with medicine. Wednesday night’s premiere of the newly rediscovered “Upstream” at the Academy surpassed my greatest expectations. While I went (cursing rush hour traffic all the way to Beverly Hills, where I found parking just in time) hoping for the best, I was unprepared for what I saw: not only a beautifully preserved silent film but a droll comedy, expertly shot and directed, by a director who later would make his mark in dramas and westerns. The story is set in an actors’ boarding house, where John “Juan Rodriguez” Rogers and Gertie Ryan (pictured above) and their acting partner/rival love interest Eric Brashingham (Earle Fox) live with (among others) an over-the-hill Shakespearean star, a “sister team” consisting of a mother and daughter, and a hilarious tap-dancing duo called the Callahan Brothers, who are most certainly not brothers. Ford renders this group of struggling, mismatched entertainers with a light touch, neither trivializing nor sentimentalizing their hand-to-mouth existence. When Brashingham gets a huge break–a contract to play Hamlet on the London stage–all the housemates rejoice at his good fortune. Since his luck is derived solely from his name–he’s the least talented member of a famous acting family–Brashingham even gets a crash course in “Hamlet,” courtesy of the Shakespearean actor, that results in his triumph. Months later, Brashingham–having abandoned his actor friends–returns to the boarding house to pose for publicity pictures, only to walk in on the wedding of Gertie and John. Many silent films are tedious to contemporary audiences, not only because the stories are dated but because the lack of dialogue makes them seem overly long. 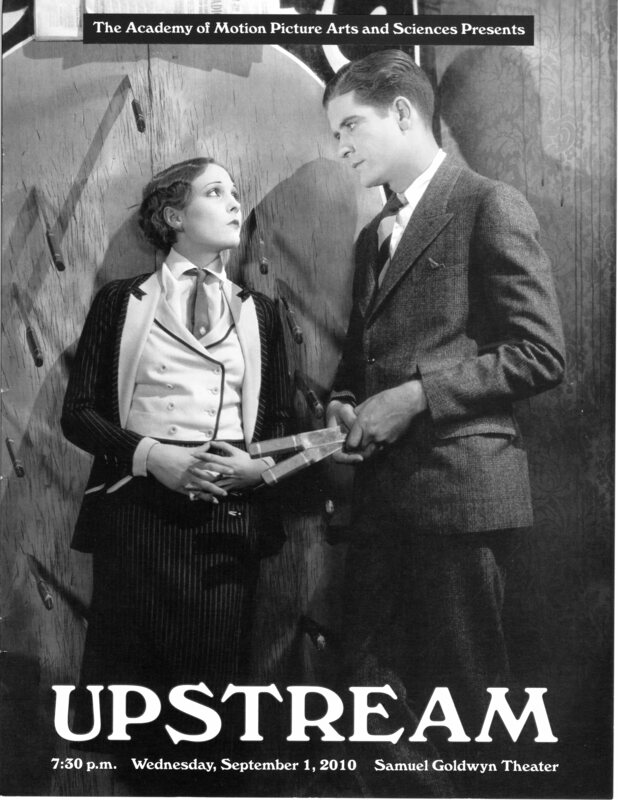 Not “Upstream,” with its riveting and unpredictable plot, clever titles and terrific sight gags. I would have gladly watched it again immediately. With any luck, I’ll have another chance to see it, as will you: “Upstream” is going to be shown in various cities, after which it likely will be available on DVD. 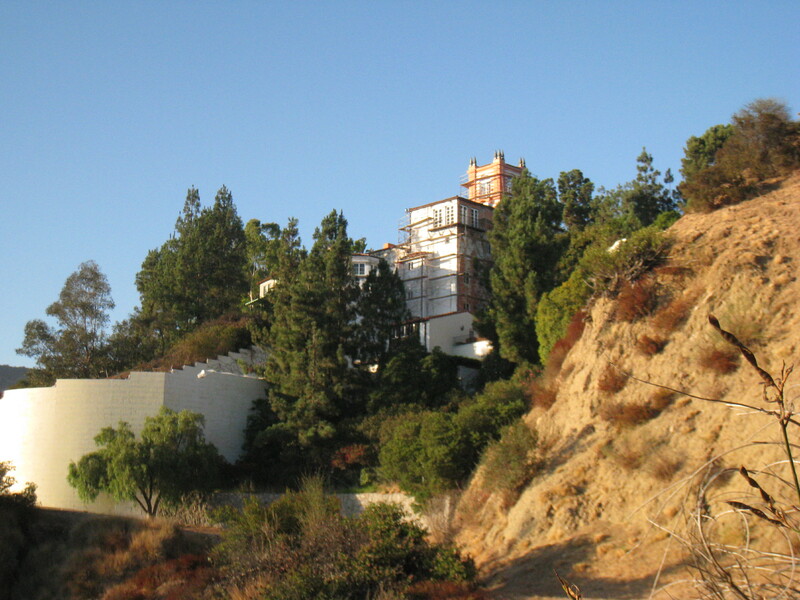 You are currently viewing the archives for September, 2010 at Under the Hollywood Sign.